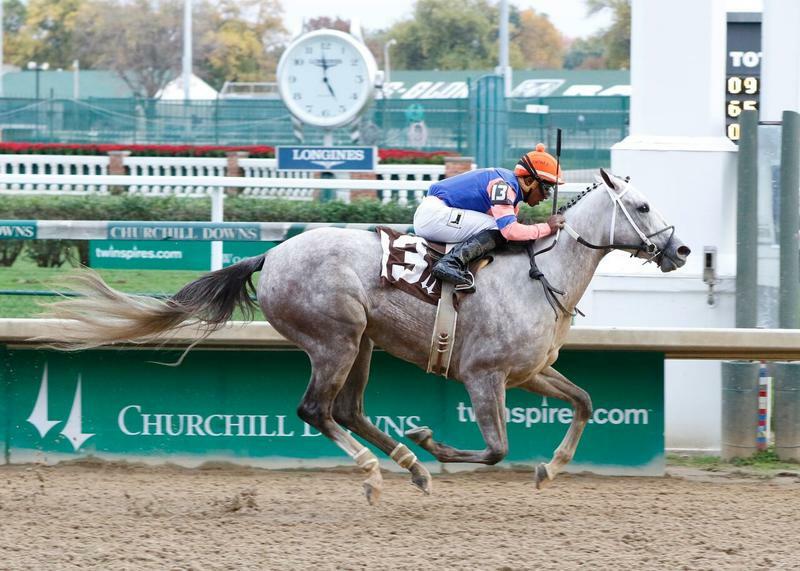 Mike Rutherford’s homebred Stageplay remained unbeaten in two starts with a 1 ½-length victory over Dream Dance in the third running of the $84,400 Rags to Riches on Sunday at Churchill Downs. Sent off as the odds-on 3-5 favorite, Stageplay rallied under jockey Ricardo Santana Jr. to beat a dozen 2-year-old fillies and stop the teletimer in 1:36.58 for one mile over a fast track. It was her first test at the distance following a dominant three-length debut against maidens over 6 ½ furlongs at Keeneland on Oct. 10. Trained by Steve Asmussen, Stageplay returned backers with $3.20, $2.40 and $2.20. Dream Dance, ridden by Brian Hernandez Jr., paid $5.60 and $4 as the 8-1 second betting choice. Family Tree was another half-length back in third under Shaun Bridgmohan and paid $6.60 to show. Royal Story, Vieja Luna, Put Da Blame On Me, Inconclusive, Covey Trace, Sensuous Pat, Arraign, Lady Day Blues, Scatmeifucan and Little Cherie completed the order of finish. Banree was scratched. Covey Trace and Scatmeifucan battled for the early lead and led the field through fractions of :22.48, :45.89, 1:11.49 with Stageplay tracking about four lengths behind in the clear on the outside. Stageplay ranged into contention midway around the turn, took command at the top the stretch and held her rivals at bay in the final stages. Dream Dance and Family Tree rallied from behind but could not catch the winner. The first prize was $48,324 and improved Stageplay’s earnings to $81,924. 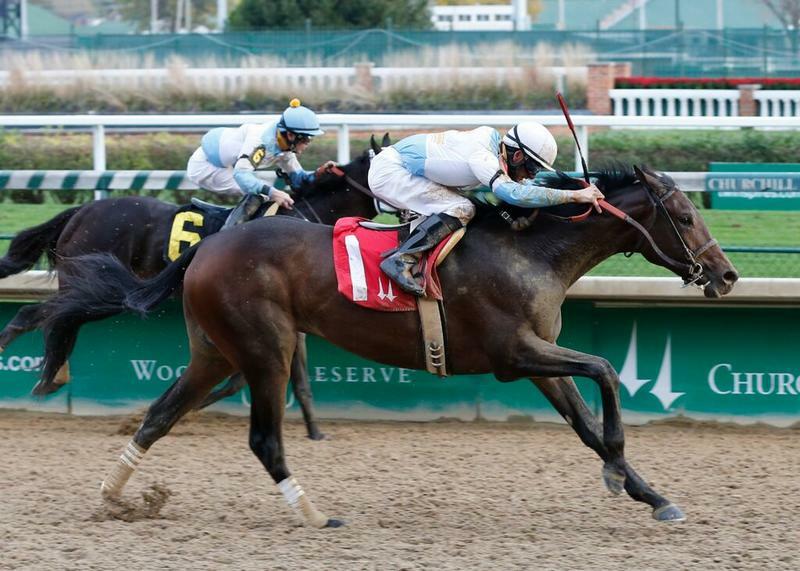 A start four weeks later in the $200,000 Golden Rod (Grade II) on Nov. 28 is likely, according to Asmussen. The Golden Rod is part of the Road to the Kentucky Oaks series and will offer 10 points to the winner, 4 to the runner-up, 2 to third-place finisher and 1 to the fourth-place finisher. 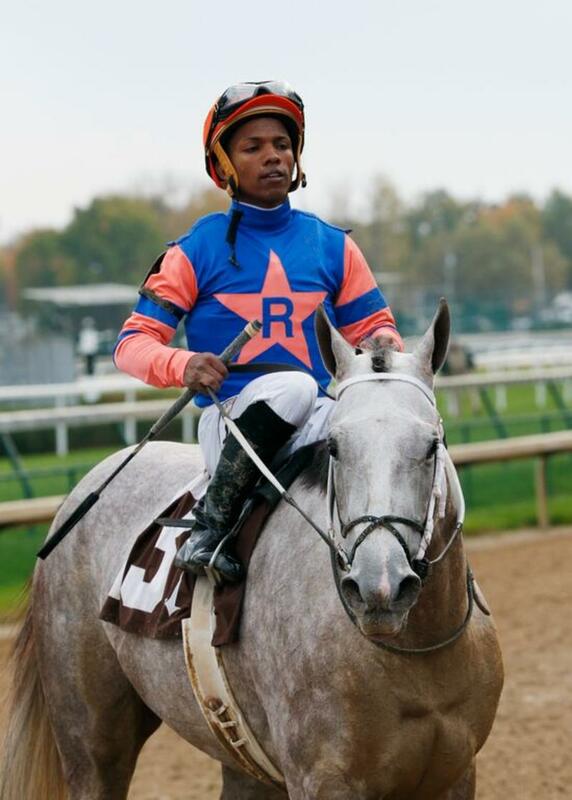 Stageplay is a Kentucky-bred gray or roan daughter of Curlin out of the Valid Expectations mare Stage Stop. The Rags to Riches is named in honor of the Derrick Smith and Michael Tabor’s winner of the 2007 Kentucky Oaks (Grade I) who was named that year’s Eclipse Award champion 3-year-old filly. Following her victory in the Oaks, trainer Todd Pletcher’s daughter of A.P. Indy defeated eventual two-time Horse of the Year Curlin to win the Belmont Stakes (GI) and become the first filly to win the third jewel of the Triple Crown in 102 years and just the third of her gender to win that race. It was clear deep in the homestretch that a 2-year-old Thoroughbred named “Tom” carrying the colors of G M B Racing would win the co-featured $81,750 Street Sense on Sunday’s opening day “Stars of Tomorrow I” racing program at Churchill Downs, but the in-house tussle was not decided until the final yards when Mo Tom held-off stablemate Tom’s Ready to win a length. Jockey Corey Lanerie rode the Chris Richard-trained son of Uncle Mo, who collected his first stakes victory and returned $12.20, $5.20 and $3.40 as the 5-1 fourth choice in a field of nine 2-year-olds. The Dallas Stewart-trained Tom’s Ready, with Brian Hernandez Jr. in the saddle, paid $4.20 and $3.40. Express Flurry Racing Stables LLC’s Uncle Brennie, ridden by Chris Landeros, finished 5 ½ lengths behind the runner-up and returned $4.20 to show. Mo Tom, who started from the rail post but made a seven-wide rally to win, covered the mile over a fast track in 1:36.78. The Street Sense was the second win in three starts for Mo Tom, who won his career debut at Ellis Park before he finished third in an allowance race at Keeneland on Oct. 8. The winner’s purse of $49,926 lifted the career earnings for Mo Tom to $73,126. The Street Sense is a prep for the $200,000 Kentucky Jockey Club (Grade II), a 1 1/16-mile race for 2-year-olds at Churchill Downs on Saturday, Nov. 28. 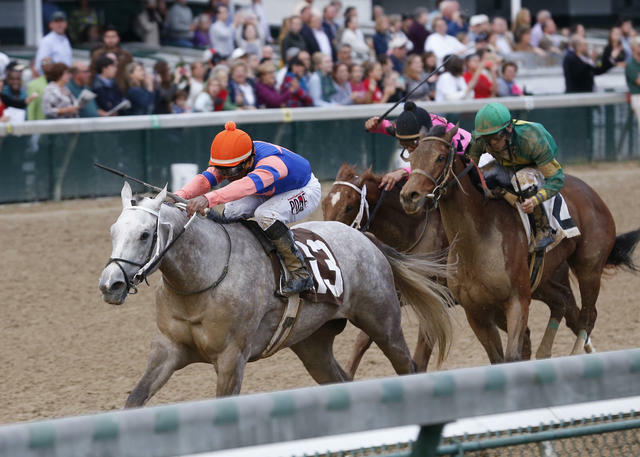 The Kentucky Jockey Club is part of the “Road to the Kentucky Derby” point series that will determine the field of 20 horses that will compete in the $2 million-guaranteed Kentucky Derby Presented by Yum Brands (GI) at Churchill Downs on Saturday, May 7. Favored Discreetness, who encountered significant traffic issues on the backstretch and in the turn under jockey Jon Court, finished fourth in the Street Sense. The order-of-finish was completed by Cotton Town, My Majestic Flight, Junkers, Pinnacle Peak and Shogood. Junkers, Shogood and Pinnacle Peak jumped from the starting to gate and engaged in a three-way fight for the early lead. Tom’s Ready settled just behind the leading trio while Mo Tom settled into seventh place in the early going. Mo Tom launched a rally on the far outside on the turn, while Tom’s Ready was shuffled back from fourth to sixth in heavy traffic and Discreetness was under strong restraint by jockey Jon Court in tight quarters along the rail. Mo Tom circled the field seven-wide at the top of the stretch to take command while stablemate Tom’s Ready swung out six-wide to chase the leader. The duo quickly cleared the field and Tom’s Ready chipped away at the two-length lead attained by Mo Tom in mid-stretch, but he could not catch his stable mate. Siding Spring, who finished 10th in Saturday’s $2 million Sentient Jet Breeders’ Cup Juvenile at Keeneland, and Huntin’theholiday were scratched from the Street Sense. Sunday doubled as Opening Day of the 21-day Fall Meet at Churchill Downs and “Stars of Tomorrow I” in which each of the 10 races was devoted to hopeful 2-year-old stars that have aspirations of trail-blazing their way to next year’s Kentucky Derby Presented by Yum! Brands and Longines Kentucky Oaks. Aside from Mo Tom and Stageplay, there were eight other winners on Sunday. Male victors were first-level allowance/optional claiming winner Force It (six furlongs in 1:10.09, $15.20) and maiden winners Rocketringo (seven furlongs in 1:24.70, $159.80), Unexplained (seven furlongs in 1:24.89, $28.60), Tiznoble (1 1/16 miles on turf in 1:48.11, $13.80) and Perfect Saint (1 1/16 miles in 1:46.24, $14). Fillies in the winner’s circle were first-level allowance/optional claiming winner Susies Yankee Girl (six furlongs in 1:11.00, $13.20) and maiden winners Durango (six furlongs in 1:10.83, $4.80) and Cinder (one mile on turf in 1:43.59, $21.80). Inaugurated in 2005, Churchill Downs’ Stars of Tomorrow programs have helped launched the careers of numerous graded stakes winners, including 36 Grade I winners and 23 millionaires led by 2010 Kentucky Derby champ Super Saver; 2011 Preakness and 2012 Met Mile and Clark Handicap winner Shackleford; 2009 Horse of the Year Rachel Alexandra; 2012 Breeders’ Cup Classic and 2013 Stephen Foster Handicap hero Fort Larned; 2012 Kentucky Oaks winner Believe You Can; and 2013 champion 3-year-old Will Take Charge. Horses showcased last year included Grade I-winning millionaires Dortmund and I’m a Chatterbox as well as Louisiana Derby winner International Star and Preakness runner-up Tale of Verve. After dark days on Monday and Tuesday, racing at Churchill Downs resumes Wednesday with a 10-race program that begins at 12:40 p.m. ET. There’s a Single 6 Jackpot carryover of $5451.22 on the final six races. For a pdf file of this news release, click here .